MUMBAI • From providing cow urine, incense and bamboo stretchers to booking a Hindu priest at the last minute, start-ups are seeking to cash in on India’s elaborate traditional funeral ceremonies. Grieving families normally have to rush between shops buying dozens of items needed to say goodbye to loved ones but now online companies are selling “final rites kits”. Many bereaved relatives – particularly busy professionals in India’s burgeoning cities – see the services as a godsend, but traditional family-run funeral shops say their businesses are hurting. When Mumbai businessman Mr Parag Mehta had to arrange a second family funeral in two weeks, he was short of time and ordered a kit online. “It made our lives easier in an extremely emotional and stressful time,” Mr Mehta, 52, said. Online start-up SarvaPooja has sold around 2,000 funeral kits for Hindu rites since its website’s launch less than a year ago. 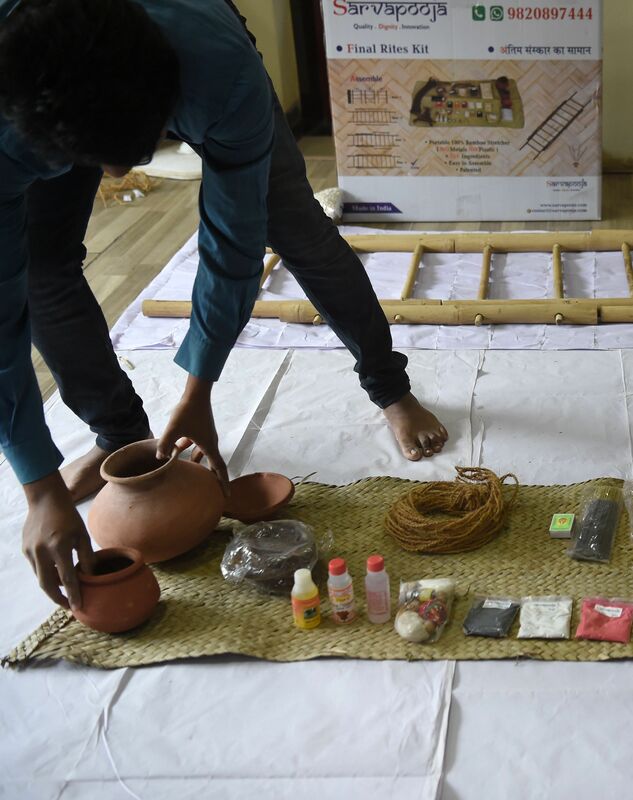 Such “final rite kits” include items for a Hindu ceremony such as earthen pots, incense sticks, cow urine and dung, rice, sesame seeds and rose water. Family members carry the deceased into the crematorium on a bamboo stretcher. They then circle the funeral pyre with an earthen pot before setting the body on fire. The ashes are often immersed in the Ganges river, which Hindus revere as holy. Mr Mehta bought his kit from Mumbai start-up SarvaPooja, whose name translates as “prayers for all”. Founder Nitesh Mehta, who is no relation to Mr Parag, said he had sold around 2,000 kits since launching the website just under a year ago. The specific nature of Hindu ceremonies – coupled with a requirement to cremate the body ideally within 24 hours or three days at the most – presented a gap in the market for a one-stop solution, Mr Nitesh Mehta said. The kit – which is sold online and in a handful of Indian cities – can be used by most traditional Hindu communities, such as Jains and Gujaratis, as well as by Sikh followers. The company is not profitable yet, suggesting that many Indians still prefer the ancient ways for now. But traditional stores say they are starting to feel the pinch. “We have 40 years experience offering customised products but people want shortcuts and quick fixes in this day and age and these platforms offer that,” said Mr Shashi Shinde, who runs a small funeral shop. “Online companies are starting to affect our business,” the 52-year-old added. Mr Nitesh Mehta, meanwhile, said SarvaPooja is considering launching funeral arrangements for Muslims. “Death is inevitable and we want to help everyone bid farewell to their loved ones with dignity,” he explained.